Albert Bierstadt was fascinated by the geysers of Yellowstone. In all his life, he had never seen anything as captivating as these bubbly, explosive fountains. His painting of Old Faithful is one of his best works. 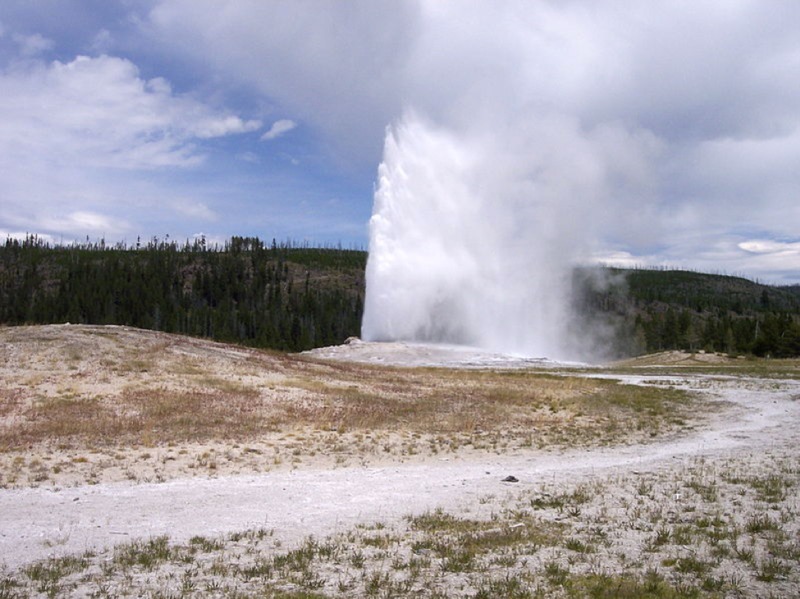 Old Faithful is a geological wonder with its consistent eruption schedule. It is not the largest or most regular geyser in Yellowstone National Park, yet it has become one of the most popular sites in Yellowstone. Albert Bierstadt, like tourists of today, was amazed by Old Faithful and his painting captures this feeling. Albert Bierstadt was born in Germany in 1830 but moved to the United States at the age of one. Early on in his life, Bierstadt showed interest in art. To jumpstart his career he returned to Germany to study art and later trained with the Hudson River School in New York. The Hudson River School’s style was focused on grand paintings of landscapes with a glowing light. Using the skills he learned in his training, Bierstadt began painting landscapes in the West. Well-known for his works in Yosemite, Bierstadt decided he wanted to explore another American geological wonder. Though Albert Bierstadt was not on the Hayden Geographical Survey of 1872, he was visiting Yellowstone at the same time as Moran and Jackson. He also believed that he was a more accomplished artist than those on the Hayden Survey. Old Faithful Geyser Yellowstone National Park ~ Source: Faulkingham, Colin. From Wikimedia Commons. "Old Faithful Geyser Yellowstone National Park," available at https://commons.wikimedia.org/wiki/File:Old_Faithful_Geyser_Yellowstone_National_Park.jpg. 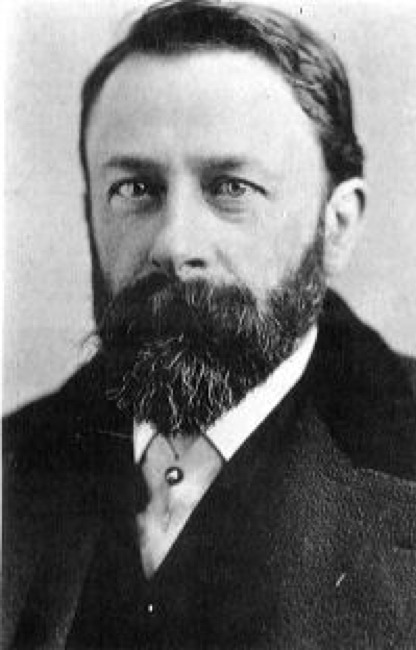 Photograph of Albert Bierstadt ~ Source: From Wikimedia Commons. "Albert Bierstadt," available at https://commons.wikimedia.org/wiki/Albert_Bierstadt. 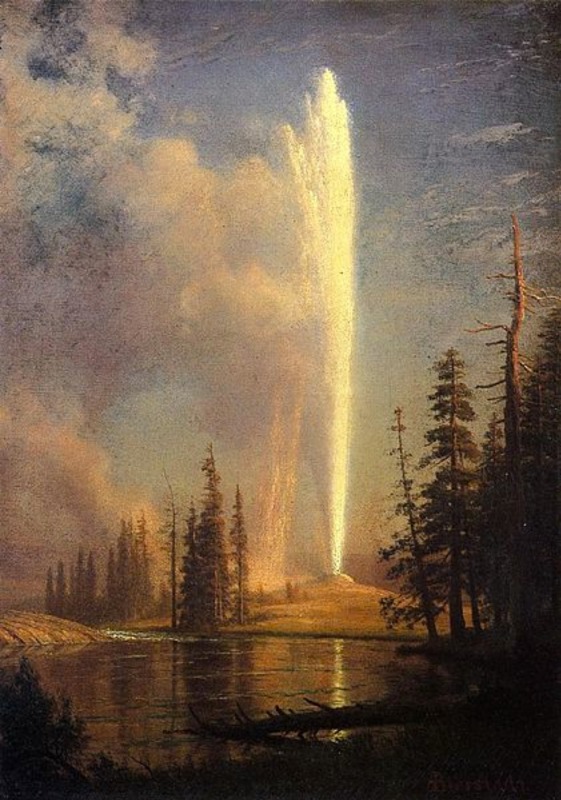 Emma Tolman, Brigham Young University, “Albert Bierstadt's Old Faithful,” Intermountain Histories, accessed April 19, 2019, https://www.intermountainhistories.org/items/show/159. Hassrick, Peter H. Drawn to Yellowstone: Artists in America’s First National Park, Autry Museum of Western Heritage, 2002. Denver Republican. “Albert Bierstadt, the Artist, in the Yellowstone Park,” November 7, 1881. 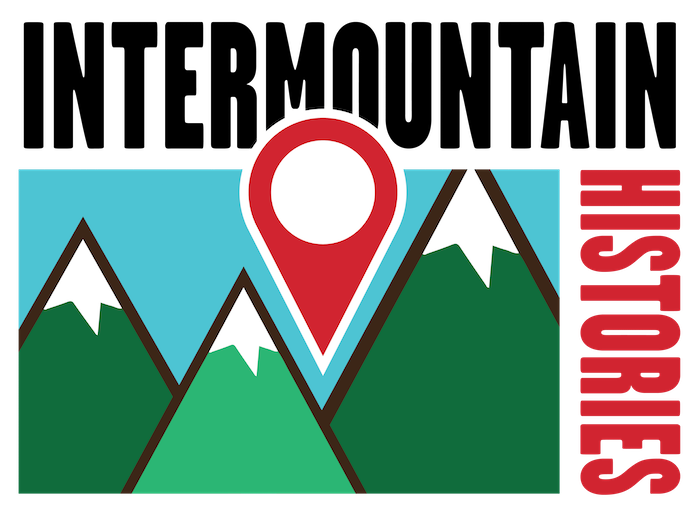 From the National Parks Service. "Old Faithful Geyser," available at https://www.nps.gov/features/yell/tours/oldfaithful/oldfaith.htm.